Only two groups on site this weekend but both very large which kept things busy for everyone. 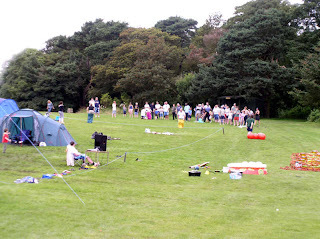 Angus area scouts were holding a parent and child camp which was very well attended. Saturday was spent taking part in a few of the site activities including climbing, abseiling, crate-climbing and challenge course, with a good competitive nature developing between the youngsters and their parents. The largest group on site were a joint Boys' and Girls' Brigade unit from near Birmingham who arrived early on saturday afternoon. Due to the distance they had travelled, they had hired almost all their equipment from the site including tents, marquees and cooking equipment which the staff had ready for them arriving. Well over 100 were in attendance and the girls and boys set up their own individual camps on site for their week-long stay. Saturday evening was very lively - Angus area scouts having a disco in the wet weather hall and the Brigade running their own entertainment. 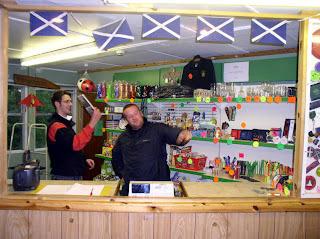 As usual the Fordell shop was open and was very popular with a steady stream of bargain-seeking youngsters. Above : Open All Hours (or at least 7-8pm) - Fordell's own Arkwright and Granville during a quieter spell in the shop. Above : Hamish the local rodent thought he had found the perfect way to get free food - sneak in while the shop is open, pretend to be a display item and then eat all the sweets he wants when the staff leave. 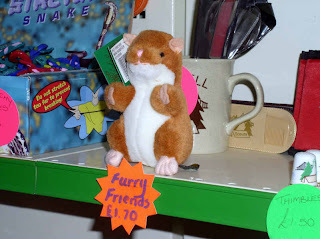 It all went perfectly until he smiled a little too cutely at one of the customers and was promptly placed in a paper bag, sold for £1.70 and taken off to Dundee forever. Sunday was quiet for the staff as the only activities were self-supervised ones such as cycling. Due to bad weather, the ground in the Boys Brigade's marquee had become very muddy so a few of the staff installed a wooden floor over the whole area. Bob the warden also took advantage of the lack of activities to fell a few trees on site which were showing no signs of life, and looked like they could be a danger to visitors in the future. The weekend finished with the Angus area scouts running a big 'It's a Knockout' tournament on their site, which gave the parents a chance to compete against their own children and later realise that perhaps they weren't quite as fit as they used to be and should perhaps renew that gym membership.